Above and Beyond is a quiet place for solitude and relaxation. While at Above and Beyond enjoy a beautiful view of the Blue Ridge mountains, and the nature all around. Above and Beyond is the perfect place for just the two of you, or for small group getaways. Enjoy the Jacuzzi tub in the master suite, the hot tub outside, shooting a game of pool, or relaxing on one of the covered porches. There are also some great little hiking trails from this cabin for some beautiful and peaceful times. Above and Beyond is located about 12 minutes from the town of Blue Ridge, GA that is great for shopping, dining, and wonderful sightseeing. Also, within a few minutes of the cabin is horseback riding, white water rafting, and hiking trails that lead to beautiful and pure mountain waterfalls. While in the cabin enjoy the nice sized television in the living room, the wood burning fireplace, or cooking a gourmet meal in the nicely appointed kitchen. For a relaxing and enjoyable time also check out one of the many games at the cabin for your enjoyment. Above and Beyond is a great place to have that perfect getaway that you have been looking for. 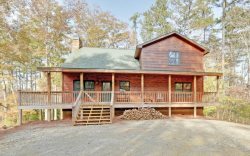 This Blue Ridge, GA Cabin Rental is located approximately 15 minutes from Downtown Blue Ridge, GA. The cabin is on up on a beautiful mountain in the Morganton, GA area.This cabin has a great location and is convenient to Downtown Blue Ridge, GA, Lake Blue Ridge, the Toccoa River for tubing and the Ocoee River for Whitewater Rafting. Also, horseback riding and zip lining are other close by activities. Above and Beyond is very private and is considered a secluded Blue Ridge Cabin Rental. This is a great Blue Ridge Mountain view cabin, and is a true log cabin. This company make you feel as though you are part of the family through out the entire process! they are always working to make sure your stay with them, will be something you won't forget anytime soon! Very quite with an amazing view! the entire cabin is gorgeous! The rental process was smooth and the communication with the management company was seamless and they were very responsive! Your team was amazing and did a fabulous job with the grocery shopping ahead of time for us! Thank you! We had a very relaxing time during our stay. We lead hectic lives with kids and work, so having a vacation that was completely done for us was amazing! We enjoyed the cabin as well as the town. Georgia was extremely pleasant to deal with and very knowledgeable. She got me exactly what I wanted and all transactions complete within minutes. Thanks Georgia!!! Slept very well and felt secure the whole time. Its perfect for a couple or small family. Gail was extremely helpful and accommodating with my cabin rental! Her service was the main reason I booked with Georgia Mountain Cabin Rentals. We went for a weekend, but I wanted to stay longer. Loved the quiet and the seclusion of the cabin. The cabin was awesome! We had a great time and we plan to be back soon. We did meet the staff just around closing time on Monday evening and they were super friendly and helpful. Everything was better than we expected. The communication for the check in instructions were great. We loved that it had a keyless entry.The overall experience was much better than we expected. The entire transaction was easy and efficient. Everyone was friendly and helpful. Had an amazing trip and cabin was great! I LOVED EVERYTHING! The hot tub was amazing and the kids enjoyed it as well. We enjoyed playing pool and the other games such as scrabble and enjoyed a few movies! Everyone I spoke with was friendly and professional. I really enjoyed our stay!! The views were beautiful, and the cabin was clean and ready for us when we got there. We will be back!! Thank you!! We had a wonderful time. The Georgia Mountain Cabin Rentals made it easy to rent a cabin and get away to the mountains. The property is beautiful. The owners thought of everything. It was a very comfortable cabin with beautiful views of wooded land surrounding the cabin. It was very easily accessible, but felt secluded when you were in the cabin. I will definitely rent this cabin again if I am ever visiting the area in the future. Great company with very friendly staff. Our stay was very pleasant and the property we stayed in was excellent. We loved the cabin, and the location! Would absolutely stay here again! Overall it was an enjoyable relaxing trip. Beautiful property and amazing staff at Georgia Mountain Cabin Rentals! It was a very beautiful, well maintained cabin with all the amenities you could ever think of. The written instructions for the direction to the cabin were very helpful. I enjoyed my trip. Georgia mtn cabins exceeded my expectations in every way possible. The cabin was exactly as shown, and the staff was helpful, friendly, and went out of their way to help me set up.a special surprise for my boyfriend. Everything was perfect! Overall, we enjoyed ourselves. The girls had a blast just hanging out and doing what 16 and 17 year old girls do...giggling, talking, eating, laughing, on their phones, taking pictures, etc. The cabin is just precious and we enjoyed all aspects of it. Amber was super sweet and arranged to have a cookie cake and balloons already in the cabin when we arrived as a surprise for my daughter. That was a fabulous added touch. This cabin was amazing! The beds were very comfortable and it was a very well maintained cablin. It is perfect for a couple or two who just want to get away.